Even though Finland is a relatively small country in terms of population, it has had a large imprint on the sport of hockey. Last season, 39 Finnish-born players skated in the NHL. The Finnish Ice Hockey Association (FIHA) has proven it does a great job of growing and developing its players, getting them ready for the top competition in the world. 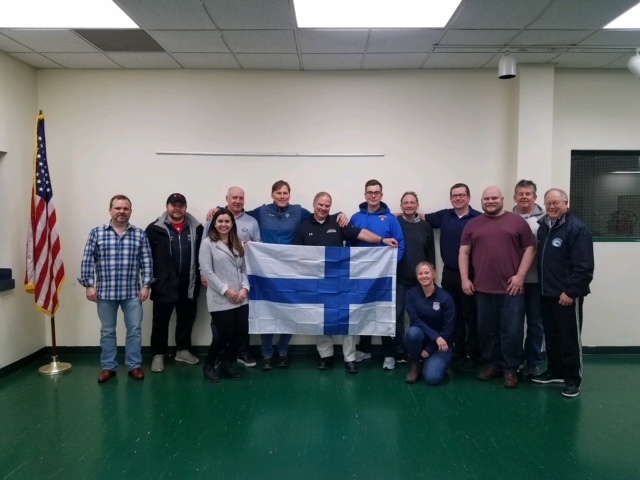 USA Hockey, the national governing body for ice hockey in the United States, and FIHA, the governing body in Finland, teamed up earlier this decade to form a development exchange program for both organizations to learn from the other’s successes. For eight days in late November/early December, two regional managers, Pekka Peltola and Jari Saastamoinen, from FIHA traveled to the United States to meet with USA Hockey representatives in Illinois. Peltola and Saastamoinen had a jam-packed schedule while in town. Jablonic and his USA Hockey colleagues wanted to give their foreign friends a real taste of American hockey. Each day presented a specific focus. And each day was certainly different and informative. The group took in five hockey practices and games of various levels. “What we really wanted to do was show them our American structure from beginning hockey, so we met with the Blackhawks and their learn-to-play program and we went all the way through as far as recreational hockey, Tier II travel, Tier I travel, all the way up through USHL, college and then the pro side,” Jablonic said. One of the biggest takeaways for USA Hockey was the cooperative effort FIHA has with its programs around its home country. The collaborative effort of all the clubs working in sync is something that Jablonic would love to have USA Hockey associations latch onto. Peltola, Saastamoinen and Jablonic spent most of the day on Nov. 28 at the Chicago Steel facility in Geneva. Steel General Manager Ryan Hardy found it informative getting ideas from some great hockey minds. “Any time that you can pick the brains of people that are doing something at a high level like they are at the upper level of FIHA, I think it’s a great opportunity for myself and our coaches and our players,” Hardy said. Hardy was able to sit down with the Finnish guys and chat as well as have them offer on-ice instruction. 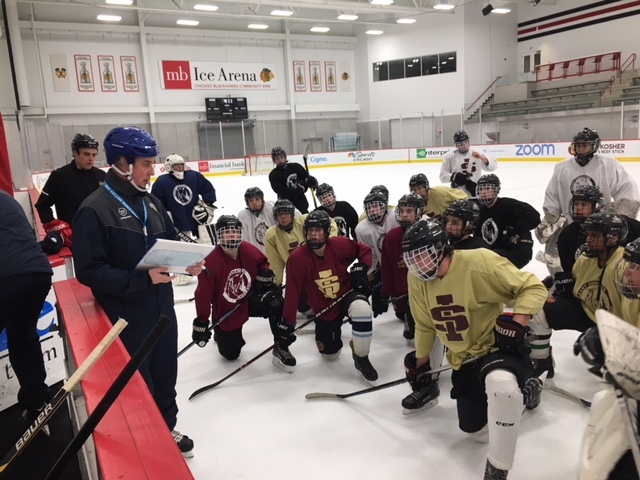 The first day the Finnish reps were in the United States, they went to Franklin Park — which is a Tier III program — to see how practices run for recreational hockey ages 8U to 18U. Hockey director/assistant manager Tim Monroe had two girls’ teams, 12U and 14U, on the ice along with a boys’ squad. “We had an ADM practice and the Finns and Dan, everyone jumped in,” Monroe said. “We had our coaches design practice and then they just jumped in and helped us out where they could. FIHA prefers to run plenty of competition-based games during practice to get players constantly skating, noticed Monroe. USA Hockey’s ADM works in a similar fashion. One takeaway Monroe had from listening to the Peltola and Saastamoinen was FIHA offers a sort of an a la carte menu for its players. If a kid wants to only play, say, two days a week, the organization will accommodate. One day might be dedicated to playing small games and the other on stickhandling. Jablonic brought the Finnish reps up to Wisconsin for a few activities. The group spent an hour with University of Wisconsin men’s hockey coach Tony Granato and his staff. Granato, a Downers Grove native, stressed how important it is for him to recruit sound academic athletes, making sure they are good kids who would fit into his program. Peltola and Saastamoinen then traveled northwest of Madison to Sauk Prairie to take in an on-ice body contact clinic. The group returned to Madison that Saturday evening to catch the Wisconsin-Penn State game. The following night, the Finns watched their second Blackhawks game in five days with the Calgary Flames in Chicago. USA Hockey is looking to continue and expand the development exchange program with FIHA in the coming years. It’s a win-win for both organizations. Jablonic is planning to explore implementing a similar structure as FIHA in getting programs around Illinois working together.